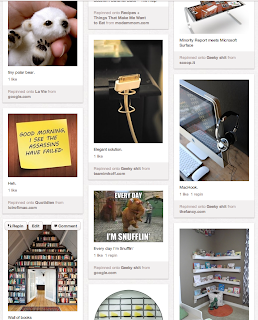 Does my Pinterest reveal more about me than my Tweets or Facebook updates do? Probably not, but it illuminates a nuance: desire. Even the infographics douches can't resist the siren's call of personal pinning, and what I find fascinating about Pinterest is its inherently aspirational quality. People pin wedding dresses, interior design ideas, branded goods, exotic destinations, and photo after photo after photo of Audrey Hepburn. (Including this creepy baby Holly Golightly.) It isn't all projection, though: you'll also find a menagerie of recipes, hair and makeup how-tos, and home crafts -- tying the site to the everyday lives of some. Barriers to entry are low -- you can get to Pinning in a minute -- and once you start Repinning, you may never stop, creating a long and ever-evolving psychographic footprint. One infographic (aptly Pinned) claims that Pinterest hit the 10 million US user mark in record time.